Single-incision laparoscopic surgery (SILS) is a recent development of minimally invasive surgery for colorectal disease. 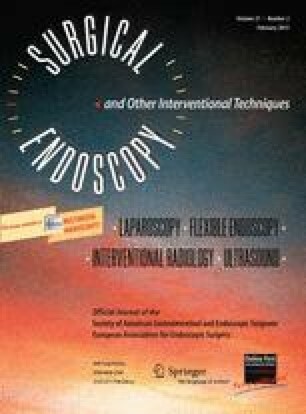 The literature comparing it against conventional laparoscopic colectomy remains limited. A retrospective case–cohort study compared the benefits and outcomes of SILS right hemicolectomy (SRH) with those of conventional laparoscopic right hemicolectomy (LRH). The medical records of consecutive patients from a prospectively collected database were reviewed. Demographic data, operative details, recovery parameters, and details of resected specimens were obtained and analyzed in an intention-to-treat manner. From January 2006 to March 2011, 104 elective LRHs (72 %) and 40 elective SRHs (28 %) were performed. The demographics for these two groups were comparable in terms of gender, age, ethnicity, body mass index (BMI), comorbidities and American Society of Anesthesiology score. As the records showed, 62 % of the LRHs and 57 % of the SRHs were performed for malignancies (p = 0.536). Seven of the LRH cases (7 %) were converted to open procedure, whereas two of the SILS cases (5 %) were converted. Three SILS cases (7 %) were completed with additional laparoscopic ports. The two groups did not differ significantly in terms of wound length, mean operative time, lymph node clearance, or margins of resected specimen. The recovery parameters (pain score, hospital length of stay, and complications rate) also were equivalent between the two groups. As a feasible and safe procedure with early postoperative outcomes equivalent to those for LRH, SRH is a suitable alternative. The possible advantages of SILS over conventional laparoscopic surgery may be validated only with randomized controlled trials in the future. Min-Hoe Chew, Mei-huan Chang, Wah-Siew Tan, Mark Te-Ching Wong, and Choong-Leong Tang have no conflicts of interest or financial ties to disclose.